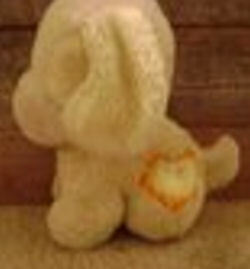 I need help finding this precious yellow puppy I’ve had since I was a baby. The puppy is light yellow, with white down the middle of its head and on its mouth area. The nose is yellow, and the eyes are threaded turquoise lines. It has two front feet and a short tail, and ears that lay flat on its head. The orange heart is on the right side of the puppy, and it says in gray lettering ‘touch me’ (in all caps). When pressed, it plays a song, but I don’t know what it plays, because the sound chip is missing from my puppy. It measures approximately 8 inches tall, and is 7 1/2 inches long from nose to tail. It’s in poor condition now. I remember the head had to be sewn back on when I was about 4… and recently my puppy had his way with it, and tore off the orange heart that said “TOUCH ME” in gray stitching. It used to play a song… but when I reached inside, it appears that the soundchip is missing (perhaps my babysitter when I was a child was the reason the head had to be sewn back on…) Anyway, this is a very sentimental item for me, and I’m having a friend repair it as best as possible, but I’d love to find a duplicate… mainly so I can hear the song and see if it brings back any memories!